I went out to shoot the Canadian on May 10. VIA has been leaving before noon these days and I knew I was cutting it close. I decided to head west of Kenaston Boulevard and as I turned off Kenaston, I saw VIA 1 rolling along beside me. I got to Shaftesbury Boulevard before them but the light was red. I shot VIA 6410 passing me as I waited at the light. They met CN 106 coming the other way with CN 8902 and CN 8920! I hit the accelerator and tried to catch up to VIA. Fortunately the Canadian was not going at full track speed and I got ahead of them by Carman Junction, where I hopped out to grab a quick shot of them. I got back in my car and pursued, hoping that they would get a stop signal at Diamond. As it turns out, they did not, but they met another train coming east. This was CN 112. I grabbed a few shots of the train as it approached. I then turned around and headed back east to get far enough ahead that I could shoot video. I slapped the Canon S3 on the ground with my GorillaPod as the tripod, then put the circular polarizer on my Canon T1i and shot CN 8869. That circular polarizer really makes the colours pop, doesn't it? Compare that to the previous shot of 8869 above and you'll see what a different a polarizer makes on a bright sunny day. CN 8023 was the trailing unit. Here's the video. I like the GorillaPod as it is easy to set up and being low to the ground, it gives a different perspective. Its size makes it easy to bring along. If you ever decide to get one, make sure you get the correct type for your camera. The smaller / cheaper GorillaPods will not support the weight of an SLR without tipping over, and are made for compact "point and shoot" cameras. Here are a few recent NB Southern videos featuring the "new" leased power. Dave Dineen aka NBSRfan shot HLCX 6318 and HLCX 8144 leading a fairly short train out of Saint John. The big cars on the head end are trash cars for the steel recycling facility now located in the Port of Saint John. Gary Lee was in the cab of GMTX 204 in McAdam. I'd really like to get back to McAdam at some point as it is really hopping now! Jason aka NB Green Machine shot a transfer freight within Saint John. The MP15DC GMTX 203 was ahead of "huff and puff", NBSR 3702 and 3703, and Geep NBSR 2610 was there for extra muscle. Apparently they almost stalled trying to get up Mill Street from Island Yard. Great video! Doubleiron shot an eastbound NB Southern freight through Harvey. It had a quite colourful consist. Gary also shot this sizable westbound freight in McAdam, headed by NBSR 2319, HLCX 6200 and MEC 354 in Pan Am colours. André Berthelot reported that the Chaleur is finally running again, at least to New Carlisle. That's André's shot at New Carlisle on May 14. It's been 142 days since they were last there, apparently! I reported on the closure on December 15 of last year. Searching for reservations on VIA Rail brings up the travel advisory that buses are being used between New Carlisle and Gaspé. Gary Klouda reported that the five ex-VIA Northern Spirit cars are finally en route to Mexico. They were spotted in Minnesota on the CPR Paynesville subdivision Thursday afternoon on CP train 490 (Winnipeg-St. Paul). You may remember I shot all of those cars when they were still in storage at VIA's Winnipeg Maintenance Centre. They have been sold to an outfit in Mexico (Ferromex) and have been at the WMC for quite some time waiting to leave. VIA Rail has been rebuilding its engines as part of the most recent capital renewal project. The F40PH-2 engines have been upgraded at CAD Railway Industries to modernize the locomotives and make them more fuel-efficient. I went into detail on the upgrades when I visited the Winnipeg Maintenance Centre. CAD delivered the first upgraded engine in July 2009. Railfans have been watching the engines go in for refurbishment, and now there is only one "original" yellow F40PH-2 roaming the system, VIA 6453. All of the other engines have either been refurbished or are at CAD now being refurbished. The second-last unit was VIA 6440 but it went into CAD in late April. VIA 6453 has been rattling around Ontario and Quebec for the past couple of months. Here are some car traces published on CanPassRail for this engine. Note that these are read at 9 AM every morning so they are not tracking every movement of the engine, just the last reader it passed before 9 AM. Most of this should be self-explanatory. The fifth column has the month, day, time of reading. The last column is the train number P039 = train #39, a Montreal-Ottawa train. 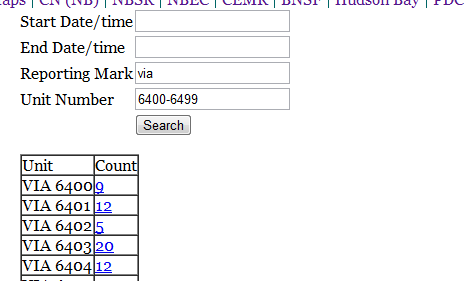 I think the last two digits are CN designations for what region the train is in. You can see 21=Quebec and 31=Ontario. 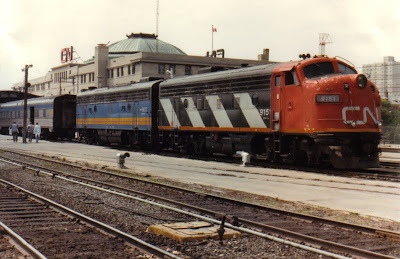 There's a photo of VIA 6453 on Railpictures.ca from May 14 here. I'd embed a thumbnail but their linking policy is very strict. I know railfans have complained in the past about the many advertisement-wrapped VIA engines such as the CBC engine, the Spiderman 2 engines, and especially the hated Loto-Quebec engine, but I suspect the complaints will return about the uniform appearance of the refurbished engines. Personally I always liked to see a wrapped engine as it was "something different". Now VIA 6453 is the only "different" engine around and soon it will have its turn to get a make-over and look just like everyone else. It's a little sad. An eastbound CN freight train had a minor derailment in Oakville, Manitoba last night (Tuesday at 9:30 PM) after an emergency brake application. The rear wheels of one grain car went off the rails, and sparks from the train started a minor fire. The fire was under control within an hour and CN was running trains on the adjacent track by 11:30 PM. The local highway 13 was closed because of the fire. Gary Zuters shot GMD1 CN 1912 (and CN 1914) in Thunder Bay, Ontario on a nice May 16, 1980. NB Southern at Chesley Drive. Photo by David Morris. The New Brunswick Southern Railway is partnering with cruise ships to offer a short train excursion for cruise ship passengers. They are calling it the Bay of Fundy Scenic Railway. Passengers will be bused to Harbour Station to board the train. 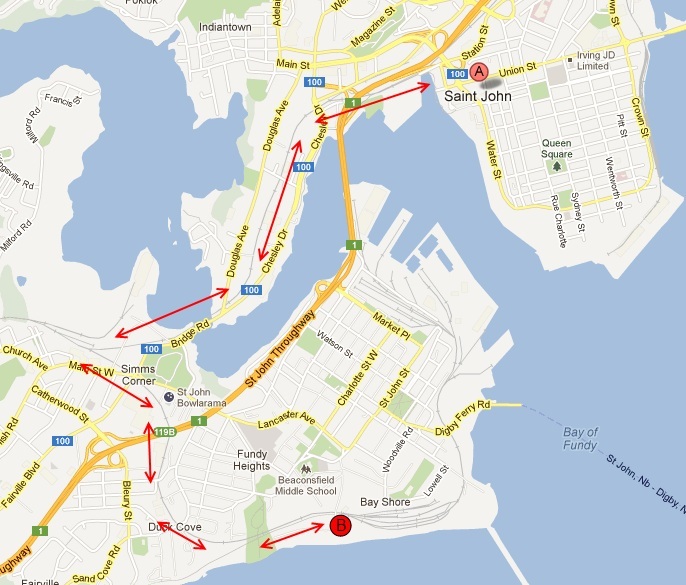 The train will then proceed across the Reversing Falls bridge and through Simms Corner, then back up to the Bayshore Yard by the site of the former roundhouse at Sea Street. That batch of passengers will disembark and the next load will be waiting for them, having been bused there from the ship. This will be repeated through the day as necessary. Disney Cruise Line has a page on it, featuring the NBSR green passenger cars and the Metis. It does not appear to be exclusive to Disney, as Royal Caribbean is also offering it. The tour will have a guide on board giving a talk on the sights outside the train. Tickets are $55 but I do not believe they will be open to the general public. This is a great initiative by NB Southern and will enhance the cruise ship experience for visitors... and also provide more railfan opportunities! Thanks to Bob Boudreau for the information. This is a follow-up to my post on Irving Oil tank cars. SteveO found a couple of great photos of Irving Oil tank cars online and shared them with me. First, Irving Oil tank cars in 1966. They are labeled as "new tankers". The Irving Oil refinery in Saint John was built in 1960, according to Wikipedia. The closest car is NCTX 22514. It looks like the other three are also NCTX cars. Here's one showing Irving Oil tank cars being unloaded at Edmundston in 1971. The tank car in the foreground is CGTX 20578. Like many oil / chemical companies, Irving leases tank cars. They used to put their logo on the tank cars, but like most companies they don't do that any more. Taylor asked me if I had ever seen any of the Irving Oil tank cars. I never saw them in Saint John, or at least I was unaware of them. However, I did see one. I was traveling with my future wife between Regina and Winnipeg when we came across the above tank car on a train. We were overtaking the train and fortunately I was not driving, so I was able to take some shots with my film camera. This is the only one I took of the Irving Oil tank car. I did some searching and all I could come up with was this model tank car from the South Shore Model Railway Club. I honestly don't know if CGTX 68020 ever looked like this. Anyone out there have any photos to share? PS see also Taylor's post! I stumbled across this great document explaining the differences between Amtrak and VIA Rail HEP (Head End Power). HEP is how the electricity generated by the Head End locomotives Power the rest of the train. The essential difference is that Amtrak's HEP is one circuit from one end of the train to another, while VIA's is split into two circuits that alternate between cars. I believe only one Amtrak locomotive supplies HEP, whereas VIA's design allows two locomotives to supply HEP (one for each circuit) with automatic fail-over to the other loco if necessary. VIA's design is more complex but more robust as well, suiting our harsher climates where loss of heat can be dangerous in winter! The document is on GN Trains' web site. GN Trains rebuilds private passenger cars so the intricacies of HEP are important to them. They have a whole page of interesting documentation. According to my notes, the New Brunswick Southern Railway now has 23 engines*. At this time last year, NBSR had 11 engines. Incredible! * - I'm not sure about the status of the Maine Central (Pan Am) engines that are on some of the main line trains. The big driver has been the operation of Maine's northern lines as well as increased traffic on its own lines. SteveO and others report that the Irving Oil refinery is expanding its rail operations. They are adding crude oil unloading racks that will have a capacity to unload 192 cars in a 24 hour period (in 4 shunts). It is widely expected that unit oil trains will be arriving from Saskatchewan. Look at trains like this one, recorded by Brian Barchard. Such a colourful consist! It looks like a return to the colourful days of 2004-2006! NB Southern railfanning is getting way more exciting. I kinda wish I was back in New Brunswick to see this. View my roster page for the complete list. Operation Lifesaver has been running their annual Rail Safety Week and posting lots of good stories and video. I see this all the time in Winnipeg, especially at crossings like Shaftesbury Boulevard and Waverley Street. There's a red light, cars start to accumulate, and people stop on the tracks. This is dangerous. Trains move quickly and stop slowly, and it's easy enough to leave a couple of cars space and stop on the other side of the tracks. Many times when I'm out shooting trains, it looks like the train is going to take forever to reach the section of track I'm standing near. However, as it approaches you realize just how fast the train is going. In many places the VIA Rail trains are going 60+ MPH and there's not a lot of time to "beat" the train. Don't do it. In many places there are two (or more) tracks at a crossing. Look at the crossing sign for the "2 TRACKS" sign. There may be a stopped train on one track, and a moving train behind that that you can't see. Be very very careful on 2 track crossings. Follow Operation Lifesaver on Twitter for more information! I had an inquiry from a woman whose grandmother took a train from Winnipeg west to Vancouver in early 1983. She was asking about trip times and also whether the Winnipeg Union Station downtown said "VIA" or "CN" on it. Getting the trip times is easy enough. 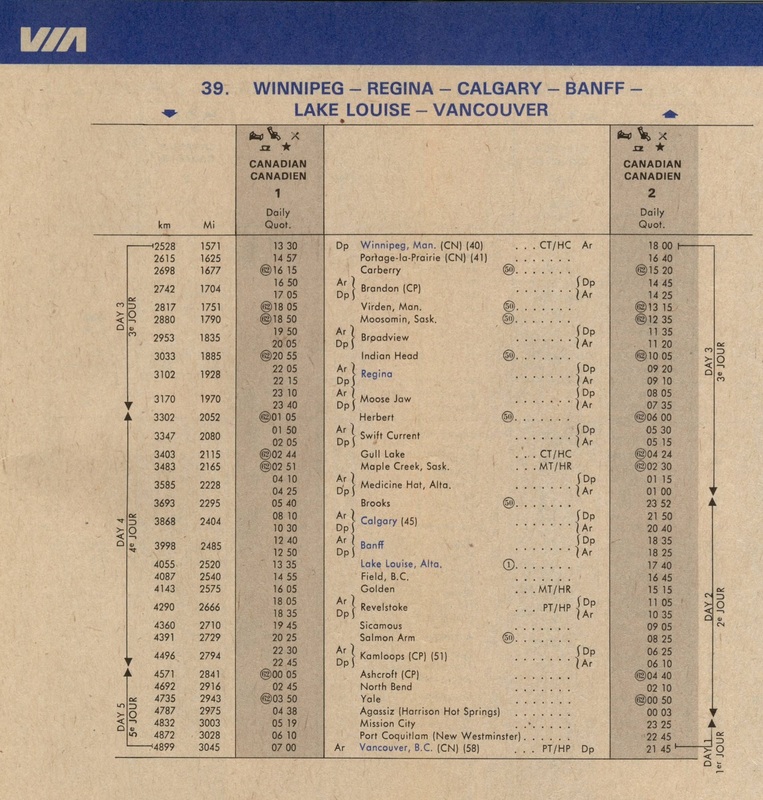 I have a VIA Rail system timetable dated November 15, 1981 (effective to April 24, 1982) and another dated May 29, 1983. The times for the Canadian in both are the same so I think it's a safe assumption that it did not change in between. VIA 1 arrived in Winnipeg at 10:00 AM daily and departed at 13:30, on CN to Portage la Prairie and then switching to CP tracks for the remainder of its westward journey. It arrived in Brandon at 16:50 and departed at 17:05. The Canadian then passed through Regina, Calgary and Banff before arriving at Kamloops at 22:30 and departing 15 minutes later at 22:45. It finally arrived in Vancouver, BC at 07:00, almost two days after arriving in Winnipeg. The Super Continental had been cancelled in 1981 (only to return briefly in 1985) so it had to be the Canadian that her grandmother took. 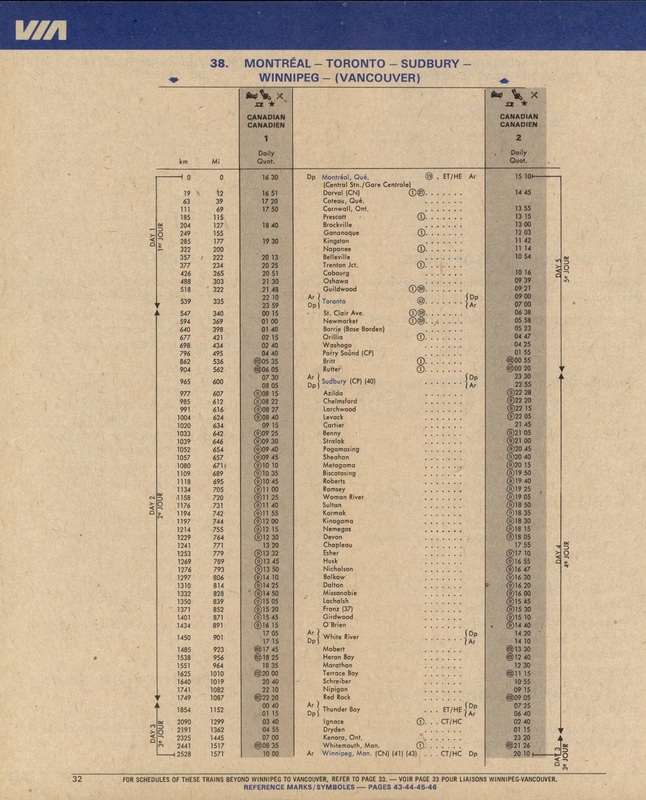 Here are the two relevant pages from the November 15, 1981 VIA Rail System Timetable. First, page 32 (Montreal - Toronto - Sudbury - Winnipeg). Next, page 33 (Winnipeg - Regina - Calgary - Banff - Lake Louise - Vancouver). Click on either page to see a larger version. Her other question was whether the Union Station in Winnipeg showed CN or VIA. Since CN owned the station until 1986, it was a good question. It turns out that the station did show CN until at least June 3, 1986 when Eric Gagnon took this photo. Click on the photo to see Eric's original blog post about laying over in Winnipeg. Mark Perry found a photo on Flickr of Union Station from 1967 prominently featuring the CN logo. Byron Thomas graciously allowed me to post these photos of NB Southern's newest engines, GMTX 2639 and 2645. Here they are hard at work pulling a transfer freight from the Island Yard in Saint John across the Reversing Falls bridge. Here they are just coming off the bridge. Byron also shot GMTX 2639 working by itself. No word on GMTX 2666 yet. Two railfans caught GMTX 2639 working the main line. First Gary Lee shot it in McAdam. The train had GMTX 2639 followed by MEC 354, HLCX 6200 and HLCX 6315. Odd to see an NB Southern train with no NB Southern engines on it. Dave Dineen then shot the train in the dark as it approached Saint John. Here's another one from Gary Lee, maybe from May 1, featuring HLCX 8144, NBSR 2612, NBSR 9802 and GMTX 2645. In other leased engine news, Wendell Lemon noted that GMTX 204 was on Tuesday's CN 406 behind the two CN engines. 204 is another MP15DC like GMTX 203. Thanks to Byron for the photos,Wendell for the heads-up, and Gary and Dave for the videos.